If you’re looking for that one beautiful gem, David Chariandy’s Brother just might be it. It’s raw and honest, and the writing is as smooth as silk. Michael and his older brother Francis are close as they grow up in 1980s Scarborough, the sons of a single hard-working mother from Trinidad. Francis was my older brother. His was a name a toughened kid might boast of knowing, or a name a parent might pronounce in warning. But before all this, he was the shoulder pressed against me bare and warm, that body always just a skin away. We lived in Scar-bro, a suburb that had mushroomed up and yellowed, browned, and blackened into life. Brother highlights the dedication of hard-working immigrant parents to provide for their children. All around us in the Park were mothers who had journeyed far beyond what they knew, who took day courses and worked nights, who dreamed of raising children who might have just a little more than they did, children who might reward sacrifice and redeem a past. And there were victories, you must know. Fears were banished by the scents of simmering pots, denigration countered by a freshly laundered tablecloth. History beaten back by the provision of clothes and yearly school supplies. Trauma and grief also play a large part in this book. Had I recognized it only then? We were losers and neighbourhood schemers. We were the children of the help, without futures. We were, none of us, what our parents wanted us to be. We were not what any other adult wanted us to be. We were nobodies, or else, somehow, a city. Nobody’s listening. There’s no way forward. It had become almost recognizable. Our neighbourhood now a crime scene cast hard in the clashing brightness of emergency. Cop cars with flashing lights were parked up and down the street, on empty lots and on the soft grass of courtyards, leaving long muddy tire tracks. There were two, three, four ambulances, and also the news vehicles with satellite dishes and milling reporters with microphones under bright TV lights. Illuminated, the buildings I had known all my life were changed. The stucco of a low-rise looked like the sole of an unwashed child; the rust on the balcony railings and fire exits of an apartment tower looked ugly and contagious, a bubbling rash. Even the ordinary clothes that people hung to dry on laundry lines suddenly looked suspicious. Conspiracies in the open hanging of slacks and saris, in headless baby jumpers. 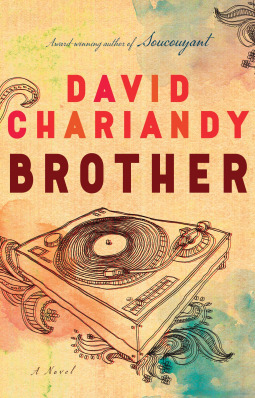 Chariandy has carefully and thoughtfully honed it all down to 180 pages; he makes every word count. The disappointment that Brother did not advance to the Giller shortlist is eased somewhat by seeing it show up on the Rogers Writers’ Trust Fiction Prize finalist list. Reblogged this on The Miramichi Reader. Thanks, James! Did it work this time? No, but I’m going to try something else…. Sounds like quite a powerful book! It is! Now I have to read his first book. I love the idea of writing how we wish things had gone. I’ve tried it, but I can never figure out how it should, or could, have gone down differently. This is the second review I’ve read of this which has made me want to go out and get a copy straight away. Unfortunately it’s not yet available in the UK but it is definitely on my watch list. That’s great! I hope it makes its way over there soon! I love that extra hour. I use every minute of it! I hope you get to go to the book club discussion – that sounds like the perfect opportunity! Such a wonderful review Naomi, isn’t this book so beautiful? fingers crossed for the writers trust prize!!! This book is on my TBR list… sadly, I missed the chance to see him a half hour away last week! Thanks for the review! This sounds like an important and very well done book. I also admire your care and hard work in linking to the other reviews for these books. This sounds excellent, and at 180 pages will definitely suit the novella phase I’m going through at the moment! My trusted Canadian blogger friends all loved this, so I’m excited to read it when it becomes available in the US! Sounds like it’s right up my alley. One of the aspects of this story that I really enjoyed was the sense of landscape, which wasn’t everywhere (not on the page) but it felt like it was all-of-a-piece with the story. That idea of something beautiful and restorative (but also wild and unpredictable) right near. His first novel was really lovely too. In a different way, and perhaps a tiny bit less polished/honed (but not like it was unfinished, just like he let more bits come in – which I loved). Whenever you get to it, I’m sure you’ll like it too! I see that Soucouyant is a whole 220 pages! The question is… will I request it now? Or later? Heheh…yes SO much longer. (It doesn’t feel much longer either, because it seemed like the chapters in it were actually shorter, so you just kept reading “one more”.) I’m betting on sooner, but who knows! Yes I’d like to read this book which I’ve heard quite a bit about! Sounds beautiful and honest & from the heart. I will get on the wait list for it at the library. I wonder if it will win the Rogers Prize?! I see from your link that it will be announced Nov. 14. Gosh some good authors on the short list. But will Chariandy win?! I think he has a good chance! But, yes, there are some other good ones there (although I haven’t read them yet). Soon we’ll know!